Character Screen Information Feedback-AKA I need the wiki to play. 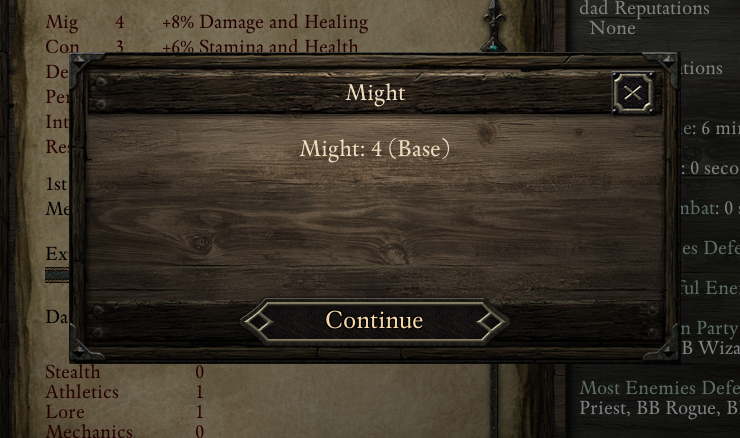 Ok you dont really NEED the wiki to play but in these types of games very few people dont spend some time looking at their character´s stats and numbers and fiddling around with them. The thing is, the game doesnt tell you what many of these mean (in either the Inventory Screen or the Character Screen) or do and even less about what is affecting them. Some are only mentioned in character creation. The game doesnt let you understand the system you are playing with. So we gotta consult the wiki, and even then you have to do some trial and error (activating->checking screen->deactivating->checking screen) before finding out if that 145 Deflection is the the base deflection or because I got Defender on BB Fighter or if that 216 Stamina is because I have high CON, I am a Barbarian or because I got the +20 Stam boots on. I cant see the calculations and I dont know what they mean. Unless I consult the wiki, which doesnt solve the numbers bit. And the base value doesnt display the same calculation as in char gen (though thats understandable as chargen stats are meant to be your "base", but it would still be nice to see where that base is coming from outside char gen). And AFAIK there Concentration/Interruption mechanic isnt mentioned outside Resolve and Perception (which, once again, arent expanded upon beyond char gen). The Inventory screen does have tooltips that work when you mouse over certain things. It would be nice to have these (with more detail like calculations and descriptions obviously) for the stats like Stamina. 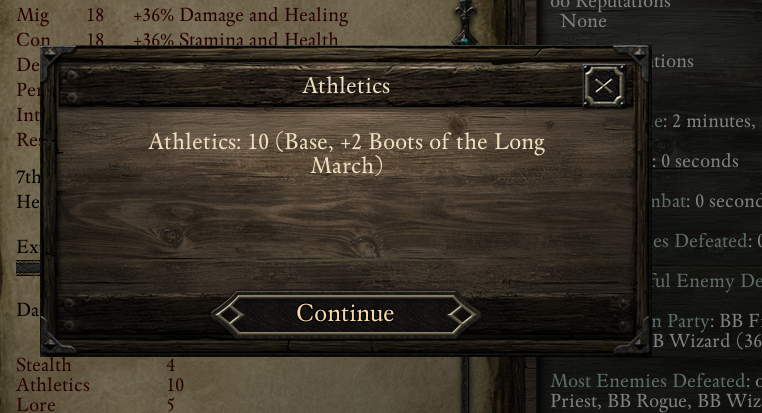 Or at least allow us to right click on the stats to see a detailed popup like with Might and Athletics in the Character screen. 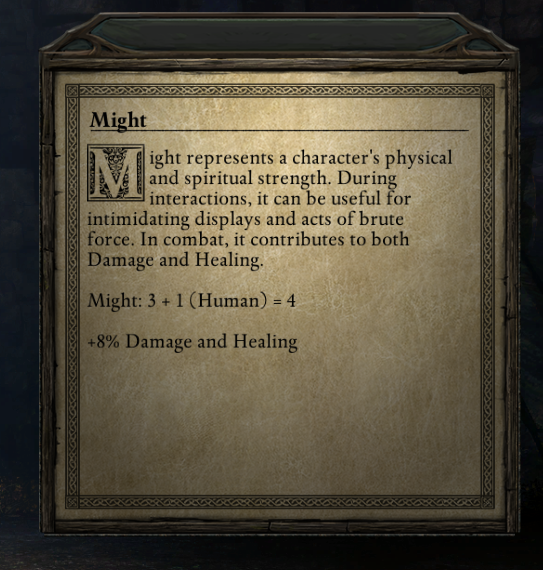 And then theres the thing with diferent damage types (shock, burn, freeze, corrode, raw, piercing, crushing, and slashing) for which natural resistances or the ones that your gear give you are unkown (chainmail good versus slashing, bad versus crushing but these defenses and damage types arent displayed anywhere in the Character Screen). DT is a mistery beyond "the more the better". Do I want more Fortitude or more Reflex? Does it matter? Does 17 Def applies to Burn damage or does it depend on what the ability is? Does Defense matter at all besides auto-attacks? Do I have to exit the game to consult the wiki every time? What Im saying here is basically: We need more information feedback on our character´s numbers. We already got a mouse-over calculation text on the combat log, why not add that into a popup-tooltip like the character Screen one if you feel its too crowded for calculations? I feel there are many ways already within the game to make the player understand the whole system better without having to alt-tab to the wiki every time he gets a new pair of boots. I just think it needs to be fleshed out more. TL; DR: More detaled Tooltips to prevent wiki-alt-tab-diving and better understanding of the new game system from the player, plus better character number-management/building. I'm pretty much with you, and the brigaded team inventory doesn't help. 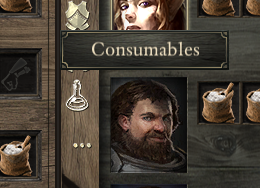 Don't get me wrong, BG1 & 2 wasn't much better (all your character / class details in that itty-bitty scrolling screen to the right of your portrait) but a generous-sized character screen with explanations of mechanics in an guide-for-dummies style would be a massive step forward. Yup. Refer to BG:EE for a good example of before/after for this kind of feedback. Original BG had very little info on how final THAC0, AC, etc were calculated. BG:EE made huge leaps in clarity and showed you where pretty much everything came from. Yeah, I can grok that idea. Would love to see how everything relates and how all the numbers are crunched. That's one of my big beefs with many games (especially RPGs): they tend to be very sparse with info on the actual mechanics of the game. At the very least, I hope OBs details all this stuff very clearly in the game manual. But in-game access to this information would be ideal. On a side note, this is one of the reasons I love my two-monitor/dual-rig setup. I can look up this stuff on one screen while still playing the game on the other. If anything this is the biggest thing I hope Obsidian differs from the IE games. Not to mention this is a different system while the one the IE games used was extensively known and documented. I had to watch tutorials and wiki-dive for three days to a week before I felt I could play Dwarf Fortress and even now I still always have the wiki open and have to look stuff up in the forums whenever Im playing. I watched a video of someone playing Rimworld just starting to learn the game with no idea what he was doing, decided "this looks fun" and went in without glancing at the wiki. Several hours and games later Ive never felt the need to look at the wiki even though theres a BUILT IN wiki button and dev blog button in the main UI. Because the game just gives you all the information you need via tooltips and 1-button/click-to-access menus right there in the game. Ive only looked at the wiki two times and those wre more for "did you know" information that was more flavor than anything. Its transparent. Its fun. Its "inmersive". Disclaimer: I know these are two polar oposite games and that DF is the superior and more complex game but that isnt what this is about. Its about feeback to the player so he knows what to do with all your game-bits and numbers. I love DF to bits but all the information is either under the hood or in obscure menus that need 10 keystrokes to access. EDIT: If the Character Screen is were all the infodump is suposed to be the make it an actual infodump. Edited by Fiebras, 07 September 2014 - 11:49 AM. Probably gonna come, tooltips and UI clarity was reported couple times and with a system like the one they're using, they gonna need it. Also, am I wrong to expect a 120-160 pages game manual with the game like the IE games had? I think expecting anything "Like the IE games" should always be converted to "in the spirit of the IE games" for this game. Especially at this point. We arent gonna get an IE game here but something else, which is both a good and a bad thing. Fingers crossed its more good than bad. Edited by Fiebras, 07 September 2014 - 07:41 PM.